Speaking about Pope Francis, parish renewal and evangelisation, the Cardinal said, ‘others have gone before us but the responsibility of parish renewal falls to us. It’s our turn now. For the process of parish renewal to be effective, the Cardinal said, ‘we must be renewed in our own personal faith because we are the ones that are called to go out and be missionary disciples. Firstly, we need to allow ourselves time in prayer with the spirit. Secondly, we need to stand confidently in the truth, and thirdly, we must have the desire to share our faith as an evangelising disciple. 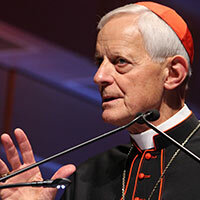 Speaking about the challenges for parish renewal, Cardinal Wuerl said, ‘the secularism experience in my part of the western world is a cultural tsunami. 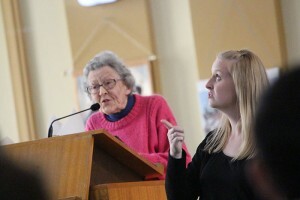 It is against this background, this diminished experience of faith that Pope Francis calls us to the new evangelisation to go-out and don’t stay wrapped up in yourselves. As we go forward, we are going to have a wonderful time of renewal in the Church. 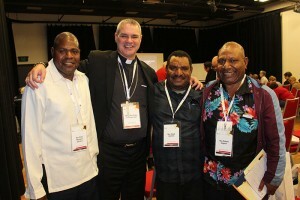 Bishop Peter with three priests from PNG, Fr Robert, Fr Elijah and Fr Elias. 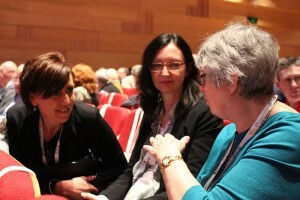 The Cardinal suggests that like Pope Francis, who understands the importance of listening, we too need to listen and accompany people in our parish mission. We are called to be echoes of God’s mercy and love.